Insomnia is one of the most frustrating challenges that many of us face. We all know how irritating it is to lie there in bed, wide awake, watching the clock tick closer and closer to the time when you have to get up. Or waking up in the middle of the night, unable to fall back asleep. Getting insufficient sleep can have significant health consequences. It has been associated with an increased risk for a range of diseases and conditions. These include obesity, diabetes, heart disease and hypertension. It has also been shown to take a toll on our judgment and perception, as well as mental performance. And anecdotally, many report feeling more stressed after periods of insufficient sleep. Many of us have heard about the benefits of taking melatonin and valerian as natural sleep aids. And those are great solutions for a lot of people. But when those options don’t work as well as we might like, many of us may turn to over the counter sleep aids like Tylenol PM, or even prescription medications. However, many sleep aids — especially prescription strength ones — come with a host of undesirable side effects. Some have been linked to an increased risk of cancer and even death. Other side effects of the various sleep medications may include hallucinations, disorientation and depression. Combined, chamomile tea and CBD oil can help prevent insomnia. There’s one that’s fairly simple. It only contains two ingredients — chamomile tea and CBD oil. 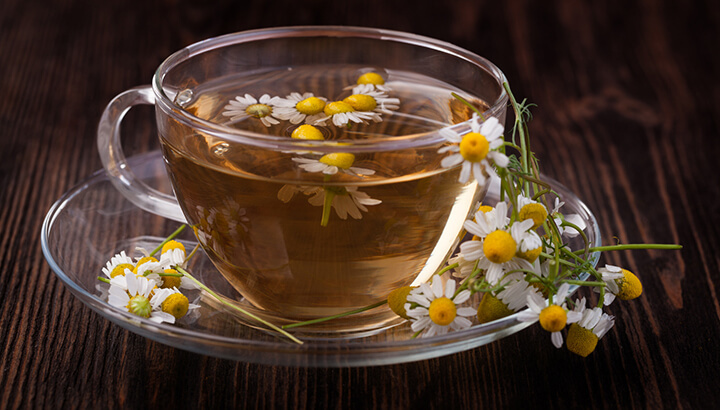 Chamomile tea has long been known for its ability to promote calmness. Research shows that chamomile is a mild tranquilizer. These effects may be due to the activity of the flavonoid apigenin, which binds to specific receptors in the brain. 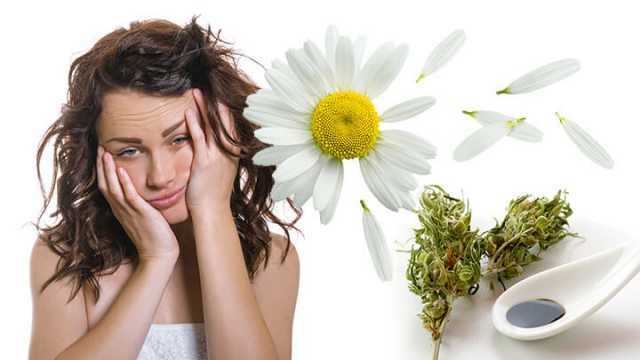 One study shows that chamomile oil may help to reduce stress. Chamomile essential oil aromatherapy is also used by many to promote sleep and reduce stress. It is also believed that chamomile can help to improve cardiovascular conditions, stimulate the immune system and guard against cancer. And as far as CBD oil, the research on this is still developing. One study demonstrates that rats administered CBD showed an increased total sleep time, as compared to a control group of rats not given CBD. However, it is worth noting that there is also conflicting research, suggesting that CBD actually promotes alertness. Clearly, more research is needed on this topic, but there is reason to believe that CBD oil might be effective at treating insomnia, including anecdotal evidence. Some companies sell products including both chamomile and CBD, like Green Roads and House of Jane. A simple Google search will yield other results as well. Or, if you prefer to make the tea yourself, it is fairly simple to do. Simply brew chamomile tea the way you normally would and then add the correct dose of CBD oil. If you’re new to CBD, start small, perhaps including a quarter or half dose until you know how it affects you. It is very important to point out that, before purchasing any product that includes CBD, you must thoroughly vet the company. In addition, you must make sure it is legal to purchase such products in the area where you live. A medical marijuana card may be necessary, despite the fact that THC — the ingredient that gets you “high” — has been pulled out of CBD oil. Reading before bed can help prevent insomnia. White noise. There are plenty of white noise apps out there. Or, you can simply turn on a fan or purchase a white noise generator. This will help to drown out other sounds that might keep you awake. Wind down. Being active right before bed can wreak havoc on your ability to fall asleep. Take the last half hour before bed to do something relaxing, like reading a book. Cut down on beverages shortly before bed. This will cut down on the frequency with which you wake up during the night, needing to make a trip to the bathroom. Exercise during the day. Take the time to expend some of that excess energy and produce feel-good chemicals to banish stress. But again, not too shortly before bed. Lower the lighting. Do this for about an hour before bed. The dimmer light will help you begin to feel sleepy. Insomnia can be incredibly frustrating. And it can have a real impact on your health. But there are a number of options for treating insomnia naturally. In many cases, medications are not necessary. Opting for natural remedies or changing your lifestyle habits can make a significant difference in your ability to fall asleep quickly, stay asleep and sleep soundly. Hey Buddy!, I found this information for you: "Try This Two-Ingredient Insomnia Hack For Bedtime Relief". Here is the website link: https://www.thealternativedaily.com/two-ingredient-insomnia-hack-with-cbd-and-chamomile/. Thank you.